Warhammer 40k Forum Tau Online » Games Workshop/40K Related » Showcase » Fire Warrior Test. Hopefully the last one. Fire Warrior Test. Hopefully the last one. It was put together with old parts (previously painted), and on a slottabase, which is why there&#39;s the gap. The base rim&#39;s a bit shonky but meh. This was certaintly a bit different for me, because i&#39;m used to painting everything with nice blends etc etc, but i just wanted a solid tabletop standard miniture. I plan to play with my Tau army, not just paint it (like my DG - over a year and i still don&#39;t have 1500 painted ). More work will be done on the suits etc, but i think this looks pretty effective off the bat. The one thing i have an issue with is the colour of the fatigues being too close to the green. What other colours could i paint it? I really want to keep the camo green armour, as it looks like a green version of Vomit brown, so it looks very similar in brightness and saturation to the Codex scheme. Favourite Bands: Ayreon, Dream Theater, Symphony X, Blind Guardian, Spock&#39;s Beard, Rhapsody, Sonata Arctica, Porcupine Tree, Phish. Re: Fire Warrior Test. Hopefully the last one. I like it as a very nice table top mini its great. And the color of the fatigues is nice just like really military would do. Nice very cool and if you do those little details and extra on the suits and leaders etc you will have a very nice army. Way to go nicely done. Thanks GD. It is only designed for tabletop, quick and effective. I *could* paint all the models to the same standard as my DG, but it would take forever. I&#39;m attracted back to tau, after a 3 year hiatus, by the gameplay, not so much the models. So i nice looking tabletop will be better than a really nicely painted single. Plus, once the army is done, i can always go back and add in the shading and details etc if i can be bothered. Nice, it has a camo feeling without too many colors, and without any camo patterns. Did you trim the sprue off the shoulder pad before you glued it, because I can still see a small raised area. That aside, it looks quite good. Yeah, ignore anything like that, the bits came from the first models i ever glued together/painted. I&#39;m a lot more careful than that these days. What do you people think would be a good contrasting colour on the armour? I painted the middle section (much like Tael&#39;s stuff - thanks for the inspiration), with shadow grey, which looks nice on the camo green, but it&#39;s very similar to the head. Thoughts? Quite cool. It looks like it could blend nicely into woods and forest. 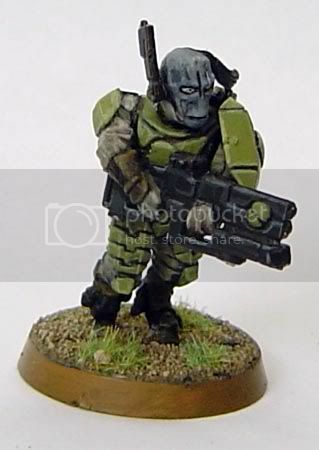 Love to see that scheme on a Stealthsuit! Nice scheme, and did you make extra depth cuts in his face? The crease lines give him a different expression and seem much more pronounced than most.